Interested in setting up one of these accounts for yourself? Learn more about the Backdoor Roth IRA and how this tax loophole can help you add thousands of dollars to your wealth and retirement savings. It’s that time of year when you’re thinking about doing a Backdoor Roth IRA. Rather than explain it each time, I thought it would be helpful to have a detailed step-by-step guide we can all reference. A Roth IRA is an individual retirement account containing investments which have the benefit of growing tax free and which will not be subject to tax at withdrawal, assuming certain conditions are met. You pay taxes on the amounts contributed to a Roth IRA today in exchange for not having to pay taxes in the future. Roth IRAs are a great strategy for making sure you have access to pre-tax and after-tax dollars in retirement. Congress has limited those who can contribute to a Roth IRA to taxpayers who earn below $132,000 for single filers and $194,000 for joint filers (these numbers change ever year). However, since 2010, the government allows anyone, regardless of income, to convert a Traditional IRA to a Roth IRA by paying income tax on any account balance being converted that has not already been taxed. Therefore, each year I make a Traditional IRA contribution of $5,500 (the contribution limit as of 2017). Because my income is too high to allow for this contribution to be tax-deductible, my contribution is known as a non-deductible contribution. In other words, I’m not deducting it from my income in the current year, so I will pay income taxes on the $5,500 contribution (i.e. it counts as part of my taxable income). Because I am allowed to convert a Traditional IRA to a Roth IRA regardless of income, I then convert the non-deductible Traditional IRA to a Roth IRA and pay income tax on any amount of the account balance being converted that has not already been taxed. In our case, that’s zero since we’ve included the contribution amount in our taxable income, so we pay no taxes on the conversion. 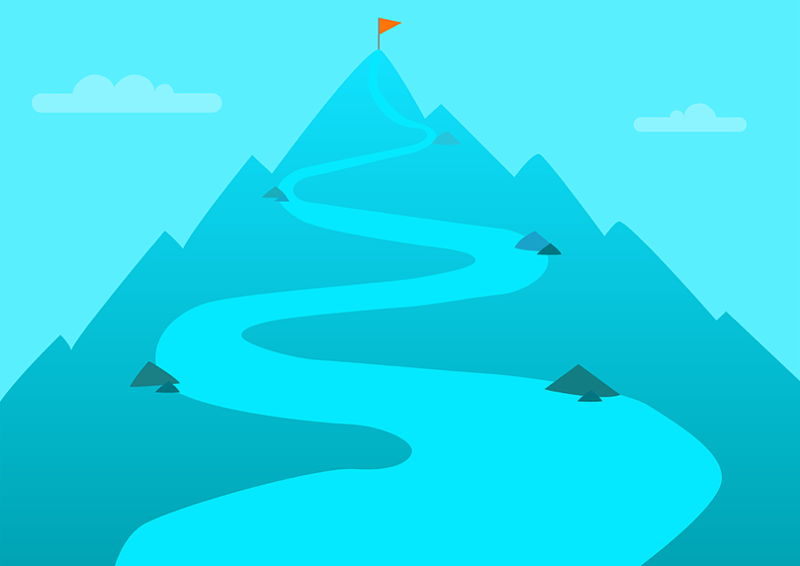 The end process leaves me with a $5,500 contribution to my Roth IRA. This is known as the “backdoor” Roth IRA contribution. Congress and the IRS are very aware of the loophole and so far have decided not to close it. Vanguard even publishes guidance on the benefits of the backdoor conversion. Do I Need To Contribute via the Backdoor? If you make less than $117,000 as a single person (or $184,000 married filing jointly), you can make a regular contribution to a Roth IRA. There is no reason to use the “backdoor”. If your income is above these amounts, you should make a backdoor contribution to your Roth IRA. 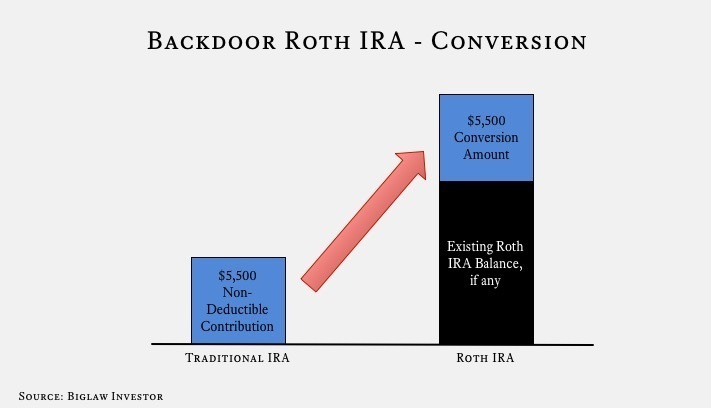 Ready to make a backdoor Roth IRA contribution? Let’s get started. Each step below tells you what to do and how to do it. If you don’t have any Traditional, SEP or SIMPLE IRAs with pre-tax money, go directly to step 2. You might have a Traditional IRA if you made pre-tax contributions to an IRA before law school or you changed jobs and rolled a previous 401(k) balance to a Traditional IRA. If you do have pre-tax money in an IRA, you must decide if you want to pay taxes on the conversion today (if so, jump to step 2). If you have a high income, you probably don’t want this money taxed at your current marginal rate and would prefer to keep it pre-tax so you can withdraw it in retirement later at what’s likely to be a lower effective tax rate. Assuming you don’t want it taxed, you need to remove the pre-tax money. This is because the IRS won’t let you just convert the non-deductible portion of your IRA. You must convert both the non-deductible portion and the pre-tax money, pro rata, when you convert to a Roth IRA. If you’re not careful and skip this step, you’ll end up having to pay taxes on the pro rata portion of the pre-tax money since you’re converting it from pre-tax to after-tax. By December 31st of the each tax year you do a Backdoor Roth IRA, you can’t have any pre-tax money in your IRAs (unless you’re planning on paying taxes on any pre-tax money you convert). Pay Taxes Now. As discussed above, you can pay taxes on the conversion today. The pre-tax money will be counted as part of this year’s taxable income. Reverse Rollover. The IRS allows you to transfer existing pre-tax money to an employer retirement plan (see IRS Publication 509A). Essentially, you can take all of your pre-tax money and drop it into your work’s 401(k) plan (or something similar). If you have good investment options in your workplace’s 401(k) plan, rolling the money over is a good idea anyway as you’ll consolidate your pre-tax money in one place. For this, your work’s retirement plan must accept incoming rollovers. Check with your HR department. Solo 401(k). If your work’s plan does not accept incoming rollovers, you’ll need to have some self-employment income so you can establish a solo 401(k) plan. You don’t need to make a lot of self-employment income to set this up, just a little money will allow you to set up a Solo 401(k) for yourself which you can then use to accept the incoming transfer from your traditional IRA. When you do a reverse rollover, you move all money in any existing IRAs to an employer sponsored retirement plan like the 401(k) offered at your work. Now that you don’t have any pre-tax money in your IRAs, it’s time to make the non-deductible contribution to a Traditional IRA. Even if your income is “too high” you can make a non-deductible contribution. If you don’t have a Traditional IRA account, you’ll need to open one. If you do have one, it should have a zero balance like mine does below. There are no special steps to make it a “non-deductible” contribution, just make the contribution. Vanguard forces you to wait one day for the funds to settle before you can convert your Traditional IRA to a Roth IRA. Some people believe you should wait longer and point to the Step Transaction Doctrine as evidence. In short, the step transaction doctrine is a judicial determination that a series of formally separate steps can be collapsed into a single step for tax purposes. In other words, theoretically the contribution to the Traditional IRA and subsequent conversion to a Roth IRA could be viewed as a direct contribution to the the Roth IRA, which would be prohibited. I have never heard of the IRS invoking the step transaction doctrine for a backdoor Roth IRA contribution. Please let me know if you are aware of it ever being invoked. Personally, I make the conversion the very next day. The money is post-tax in both situations, you’re simply converting it from a Traditional IRA to a Roth IRA. From the Vanguard website, go to your Traditional IRA Brokerage Account and click on “Convert to Roth IRA”. 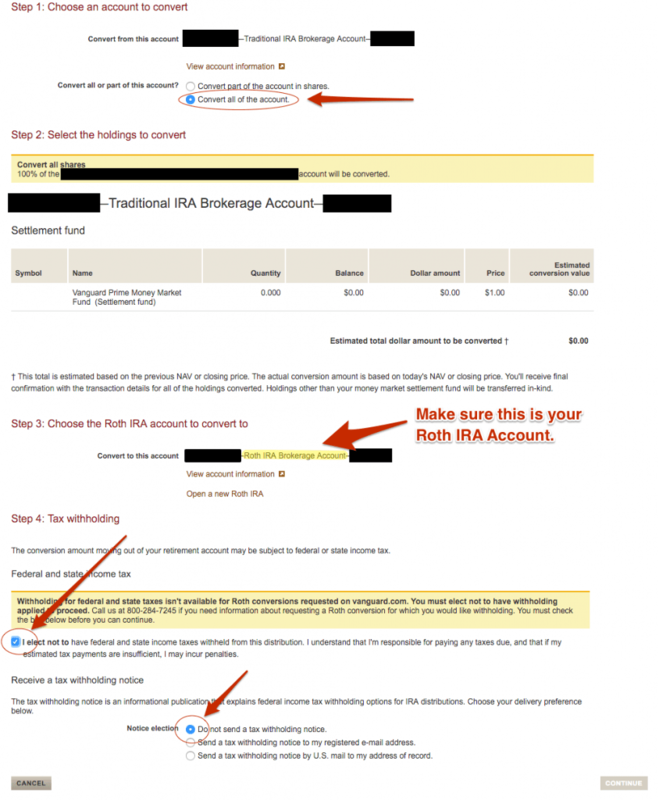 On the conversion page, select that you’d like to convert all of the account into your Roth IRA. If you have an existing Roth IRA, the conversion will roll the funds into your current account. If you need to open a new Roth IRA account, you can do that too. At the end of the day, you only need one Roth IRA account and each year you will roll that year’s contribution into the single account. After you click on “Continue”, the website will display a scary tax notice (Update 2018: This year I didn’t see the scary tax notice, so don’t be alarmed if you don’t get it). Remember, as we discussed earlier, the conversion from a Traditional IRA to a Roth IRA is a taxable event. In your case, the taxes will be zero, so it’s not a problem. Why? Because you made a non-deductible contribution to your Traditional IRA. Income tax would only be due if you are converting a deductible Traditional IRA (i.e. pre-tax money) into a Roth IRA (i.e. post-tax money). You’re converting post-tax money into post-tax money, so no taxes are due. After the conversion, congratulations! You’ve made a successful “backdoor” contribution to your Roth IRA. You are now free to invest the money in your Roth IRA account. When you report your taxes, you’ll need to make sure you have a correctly completed Form 8606. It’s a short form but there are opportunities to screw it up and confuse the IRS. 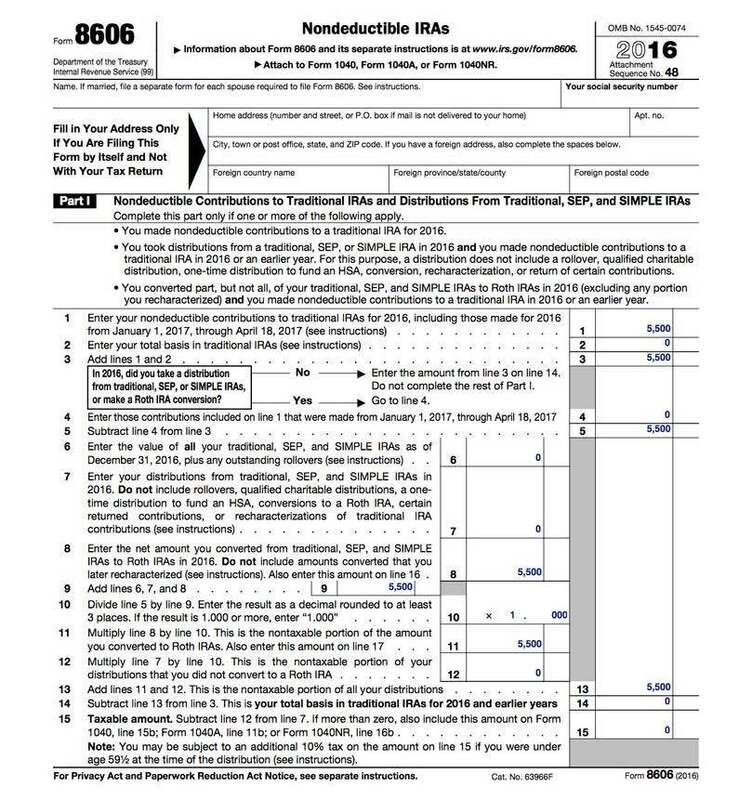 Your Form 8606 should look like this, unless you’re doing a conversion in a different year from your contribution. If you’re checking your tax-preparer’s work, focus on lines 2, 14, 15 and 18. All should be a very small amount, likely zero, unless you earned a little interest in the period between making the contribution and doing the conversion. Make sure those lines aren’t large amounts like $5,500. One interesting aspect of the form is that there’s no place to insert the date you made the conversion (your IRA custodian doesn’t report this either). Most IRA custodians will keep an account open for a year even if the balance is zero, therefore your empty Traditional IRA should be available next year for you to use again. Just remember, you cannot end the taxable year on December 31st with any pre-tax money in your IRA accounts. So, if later this year you leave your employment, you can’t roll your former job’s 401(k) into a Traditional IRA unless you “remove” it again as described in Step 1. Will Congress Close the “Backdoor”? You’re probably also wondering if one day Congress will close the Backdoor Roth IRA. There have been many discussions about closing the loophole, but as of 2017 it’s still available. Some people speculate that Congress is happy to keep the “backdoor” open because each year some people will convert existing pre-tax money in their Traditional IRA to a Roth IRA, thus generating taxable income for the year and raising tax receipts. Time will tell if the “backdoor” gets closed. Until then, you can take advantage to build a Roth IRA balance even if your income doesn’t allow you to contribute directly. The Finance Buff’s Guide is here. He also has a good post to help you make sure Turbotax, H&R Block or TaxACT reports the backdoor contribution correctly. The White Coat Investor’s Guide is here. The Michael Kitces Guide is here. Still have questions? I created a Backdoor Roth IRA FAQ. Lots of good info here BigLaw! Very useful for people outside the standard Roth income brackets. Are they any other advantages/disadvantages to the different contribution methods? That’s correct, all conversions have to be seasoned for 5 years before they can be withdrawn. It does mean that if you haven’t made any direct Roth IRA contributions to your Roth IRA, you can’t really use the Roth as a de facto emergency fund if you’re only making backdoor Roth IRA contributions. This is a fantastic job. As you and I discussed I currently have an IRA from rolling over my 401K from previous employers. I am allowed to roll those funds over to my current employers 401K plan, which would allow me to deploy the back door roth strategy without complexity. However, since I have given this more thought, the funds in my IRA are fully invested, and I use this account for a lot of my option strategies, which have expirations as far out as 2018. I don’t think I want to (1) liquidate those positions early, (2) give up the unlimited options I currently have with my TD Ameritrade IRA account (you are severely limited in a company 401K). That said, I don’t think I am going to pursue this option like I thought I would. BUT if I can get a qualified plan set up for my wife’s company, I would be more than happy to implement this with her IRA (by transferring her account to the new qualified plan). I think my homework is attempt this again in 2017. Another option is to create a solo 401(k) under GYFG (you don’t need to contribute much from the blog, just a few dollars) and then roll your existing IRA into it. Presumably you could do this with TD Ameritrade and keep the account intact. I don’t know for certain, but I also thought if you do “custodian to custodian” rollover transactions you aren’t actually liquidating the position, so you won’t have to worry about terminating options / selling assets and then repurchasing them in the new account. I’m so happy I just found your blog! Love your content. My story doesn’t make me quite your ideal audience; as it turns out, I was accepted into top law schools around this time last year and declined because I was terrified of the debt. It was scary but the journey since has been so much more exciting. Your “Start Here” page really spoke to me, though, in the huge myth 20 somethings have that they’ll work in big law for 2-3 years, pay off their loans, and bail. So many voices in my head just kept telling me it just. doesn’t. work. that. way., which is why I made the decision that I did. No regrets! But, I definitely will always wonder the sort of lawyer I would’ve been. Sometimes having so many options is more of a blessing than a curse! Anyway, thanks for writing this great content. I’ll be back. Smart move. A lot of people go to law school for the wrong reasons (i.e. they think they’ll make tons of money). If you really want a law degree, you could always get one later or through a part-time program. Sometimes the best answer to a potential pre-law student is just to say “maybe NOW isn’t the right time to go to law school” – re-evaluate in a couple of years and see if you feel differently. Hey Josh! It’s Taylor 🙂 So happy that I have learned about this blog and so grateful that you are doing it. I spent hours on it last Saturday and followed all of your advice. I am trying to follow this how to guide but I’m getting stuck on opening the Roth IRA account. I already opened the traditional IRA (at Vanguard) and made my max 2016 contribution. Now I’m trying to open the Roth IRA so that I can convert the traditional IRA. But when I reach the page during the Roth IRA account opening process that asks me to make a contribution, it won’t let me continue with a contribution of $0. But I know that I can’t make Roth IRA contributions directly. Do you know how I skip the initial contribution? Thank you! I’m not sure that you have to open a Roth IRA account in advance of the conversion. I think you can just convert the Traditional IRA to a Roth IRA (which will do all of the account opening for you) but I’m not 100% sure about that. 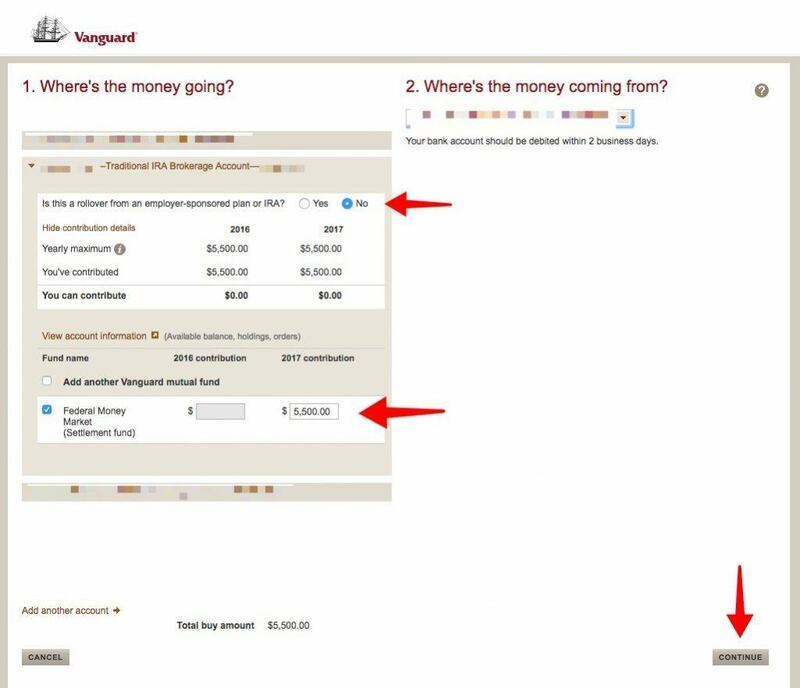 If you don’t have the option to convert to a Roth IRA (as shown in the picture), I’d give Vanguard a call and explain that you’re trying to do a backdoor Roth contribution and ask them what to do next. They will be familiar with the backdoor Roth. Hello, my non-deductible traditional IRA contribution grew in the 30 days I waited to convert to the Roth IRA (from $5,500 to $5,503). Should I still choose “covert all” on the Vanguard site, or choose only the contribution limit of $5,500? If so, what should I do with the remaining $3 in the traditional IRA? If I covert all, I recognize that I’ll pay taxes on that growth, but won’t I be going over the $5,500 limit? Any help is appreciated. I get confused on these points yearly. Patrick – Sorry for the delayed reply! This isn’t really a problem and I hope you figured that out without having to wait for me. Your $5,500 contribution to the non-deductible traditional IRA met the requirement that you are only allowed to contribute $5,500 to your IRA each year (so no problems there). After that, if you choose “convert all” (which you should) and convert any gains, you are creating a taxable event solely with respect to the gains, which in your case is $3. That $3 in gains will be taxable when you fill out your 2017 income tax return. I avoid these minor headaches by doing the conversion the next day. Hey Josh, are you making your non-deductible contributions every pay check, or are you doing one lump-sum contribution beginning/end of year? I know there are dollar cost averaging arguments/counter-arguments, but I am more curious whether doing one conversion per year is seemingly more under the radar than 12 conversions. Thanks! I do one lump-sum contribution at the beginning of the year. I immediately convert it the next day into a Roth IRA. I don’t really buy the arguments that waiting for some period of time or otherwise taking any actions will save you from the Step Transaction Doctrine should the IRS wish to reclassify it. Thank you, sir. Keep up the great work, from fellow deal counsel in Denver! Hi there! Thanks for your post. I just got an email from my CPA (on updates on Tax Year 2018) that states “No More Recharacterization of IRA Contributions. This ends the practice of ‘back-door Roth'”–Do you have any insight about this? Thanks! Yes. I’d consider firing your CPA. 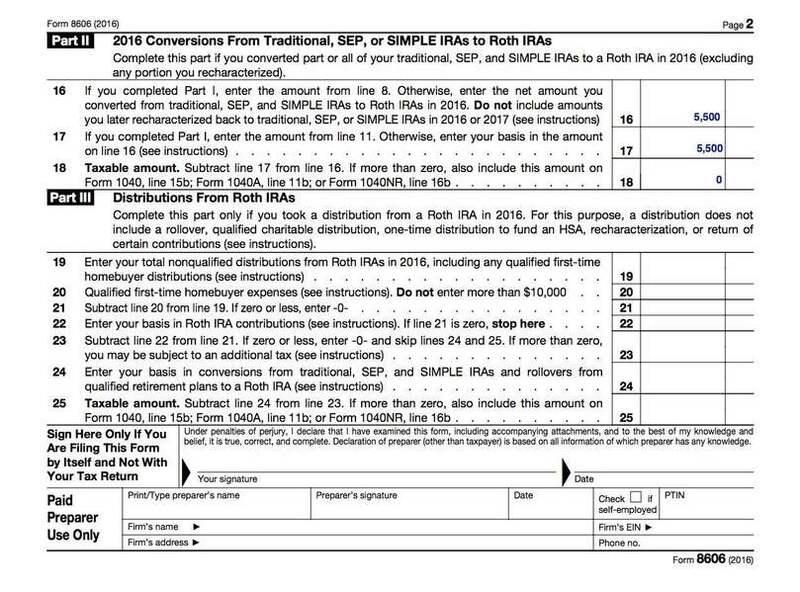 Backdoor Roth IRAs and Mega Backdoor Roth IRAs survived the recent tax bill. You can still make Backdoor Roth IRA contributions in 2018 (with no changes from previous years). It’s pretty surprising that a professional CPA would miss this and get confused. The confusion stems from the fact that IRA recharacterizations have been eliminated. What’s a recharacterization? It’s a process that allows you to switch the type of IRA (i.e. Roth IRA or Traditional IRA) through October 15th of the year after you made the original contribution. Why was it helpful to be able to recharacterize IRAs? “If the value of your IRA decreases after a conversion, you can recharacterize the conversion, avoiding the tax on the original conversion, and then convert the IRA at a lower value for a lower tax bill. This is the most common way to save taxes with a recharacterization. This will be disallowed starting in 2018. Since you can no longer do an IRA recharacterization, this means that once you convert your Traditional IRA to a Roth IRA you can no longer go back. That’s fine for us because we’re making a non-deductible contribution anyway (so already paying taxes on the money) so there never was a scenario where you’d want to undo a Backdoor Roth IRA contribution anyway. If you can’t “hide” the Traditional IRA by doing a reverse rollover (bummer – your employer won’t let you?) or opening a solo 401(k), then your options are pretty much limited to converting it into a Roth IRA. Since it’s a relatively small balance, I probably wouldn’t worry about it too much and just do the conversion. You’ll pay income tax on the $7K at potentially a higher marginal rate than you would in retirement but you’ll get the money in a Roth account where it will never be taxed again. The ~$2-3K in taxes you may pay upon the conversion is worth the price of being able to do Backdoor Roths going forward. The reason why you have to convert the $7K and can’t just open a separate account to make your Backdoor Roth IRA contribution is that on Line 6 of Form 8606 you’re required to report ALL Traditional, SEP and SIMPLE IRAs, so the IRS will force you to convert the deductible contributions pro-rata if you do not convert the entire balance of your IRAs. to maximize my backdoor-Roth IRA contributions, I made a my 2015 non-deductible $5500 contribution to my Trad. IRA in early April 2016. Then, I converted that amount on 4/25/2016 to Roth, so I am carrying a basis forward (not the clean backdoor way, but I was able to get a 2015 contribution in, when I found out about this backdoor Roth IRA in early ’16). I continued to make monthly contributions to my Trad. IRA, and on 12/31/2016 I had about $3263 in my Trad. IRA. This amount seems to have screwed me on my 2016 Form 8606, as it was essentially subtracted from my nontaxable portion, in line 6. (I wasn’t aware of the $0 on 12/31 strategy at the time). To double-screw myself, in calendar year 2017, I made about $3250 of non-deductible contributions for 2016, so that was also deducted from my nontaxable portion calculation, in line 4. It seems like I did the two things you should avoid – does that sound right to you?